Just last week, Governor Pat McCrory stood among the panels of a Willow Spring solar farm and declared June to be Solar Energy Month in North Carolina. The industry has done a lot for the state of North Carolina, after all. Solar energy has created around 2,000 jobs for the state, lending a huge helping hand to North Carolina’s stalling 8.9 percent unemployment rate. The state also ranked fifth in the nation for solar installation in 2012 and is expected to take the number four slot in 2013. Wondering if solar energy help your family and its finances? Let’s take a look. The Tar Heel State is at the forefront of solar technology. There are already another four major solar projects on the way, which will create an additional 700 jobs for North Carolina citizens. These jobs are stable and belong to an industry that is generally considered to be recession-proof. Workers employed by forms of renewable energy technology can count on the industry to expand and grow for decades to come. Much of solar energy’s attraction to the state is due to North Carolina’s Renewable Energy and Energy-Efficiency Standard (REPS). This piece of legislation was approved in 2007 with support from both Republicans and Democrats, which is no easy task these days. As each party recognized the value of the bill, so did the citizens of North Carolina. Since 2007, REPS has helped your family’s finances in several ways, although you may not have known it. Not only does the bill require each investor-owned utility provider in the state to obtain 12.5 percent of their electricity from clean energy by the year 2021, it has literally put money back into your wallet. Solar energy initiatives contributed over 3.7 billion in clean energy funds to North Carolina’s economy, which helped law makers to put off major tax hikes. Solar energy has also lowered residential energy bills and that’s a giant helping hand for those families who are currently struggling to make ends meet. How Does Solar Energy Save Money? By placing a series of solar panels on your roof, the sun’s rays are converted into electricity. That electricity then flows down to a circuit breaker, where it is distributed throughout your home. What results is a lower electric bill for your family. Making solar even more attractive, most states, including North Carolina, offer tax incentives for those people who choose to “go green” by adding alternate forms of clean energy around their homes. Currently, North Carolina offers you a tax credit that’s equal to 35 percent of the cost of renewable energy property constructed, purchased or leased and placed into a residence. You can also get solar rebates for installing things like solar water heaters. In addition, those families who spend at least $5,000 on a solar system are eligible to receive an uncapped 30 percent federal tax credit from the government. It’s money in your pocket for investing in clean energy and the savings can really add up. 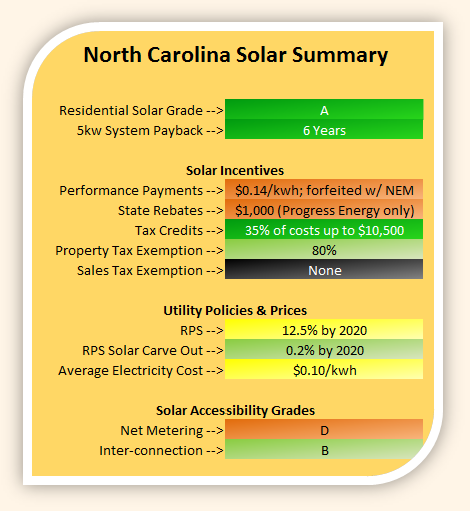 How Much Will Solar Installation Cost North Carolina Families? Okay, here’s the catch. 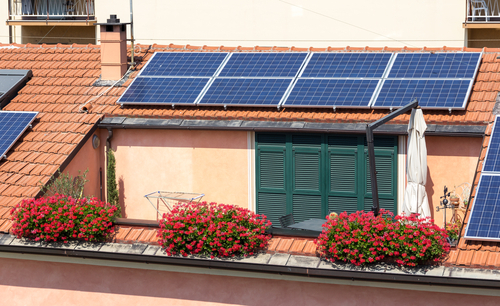 A typical solar panel electric system installation for your home will run approximately $20,000. While that sounds like an unreasonable amount of money, it’s important you look at it as an investment for your family’s future. For example, an average solar panel system will produce enough electricity to cut at least 30 percent of your home’s electric bill. That adds up month after month, especially when you consider all the utility rate hikes that North Carolinians have been hit with lately. In fact, a study released during 2012 showed that customers of the North Carolina Eastern Municipal Power Agency (NCEMPA) are now paying electricity bills that are much higher than those compared with the rest of the state. While you may think the rising cost of energy plays a role in such a rate difference, it’s actually NCEMPA’s $2.3 billion debt causing North Carolina citizens to pay more on their electric bills. Think about it: A power provider gets itself into debt and then passes that debt along to you and your family. If you’re among the thousands of North Carolinians already struggling with their own debt, how is it fair for a power company to force its debt onto you? Solar is sounding better and better all the time, huh? Even if you can’t afford your own solar panels, try celebrating Solar Energy Month in North Carolina by recognizing the many benefits solar energy brings to North Carolina. Maybe you find yourself struggling with long-term unemployment or unable to pay your own electric bills? Take this time to schedule an appointment with an experienced North Carolina bankruptcy lawyer and find out how Chapter 7 or Chapter 13 bankruptcy can help.